We thought it would be timely to introduce the personas we have also developed for the Hunterian museum and the Antonine Wall display and how we used them at the 1st EMOTIVE User Experience Design Workshop in Glasgow in February. Each persona we designed for the Hunterian museum is an individual person, that is they have sole identities detailing their own character and behaviours (backgrounds, hobbies and interest); their relationship with technology (type of devices they own or are comfortable using and software they have access to); and specific challenges they bring to a museum visit or frustrations they have (views on museums and heritage, interpretation and technology used in museums, accessibility issues) (image 2). Our own research on the Hunterian visitors, as well as that carried out for the CHESS project that some of our EMOTIVE partners had worked on before (Katifori et al. 2016) confirmed what is reported in the literature; that most people visit museums in groups as museum visiting is a social activity (e.g. Falk & Dierking 2012; Falk 2016; Hein 1998). Therefore, the five individual Hunterian personas were created with this in mind and any two (or more) individual personas are able to be combined to create a group persona: for example Carlos (a 25-year-old Engineering Erasmus student who doesn’t like reading lots of text panels in museums) and Susie (a 21-year-old Hunterian MUSE volunteer guide who is also a Museum Studies Masters student) may bump into each other in the museum, they get chatting about the display at which point Susie shows the EMOTIVE tool to Carlos and they decide to use it together. Or the persona of Susie could be combined with that of Mary (a 71-year-old Friend of the Hunterian and grandmother who wants to pass on her love for objects and heritage to her grandchildren) and Annie (Mary’s 15-year-old granddaughter who is bored by museums but wants to do something nice with her granny) to create a different group scenario. 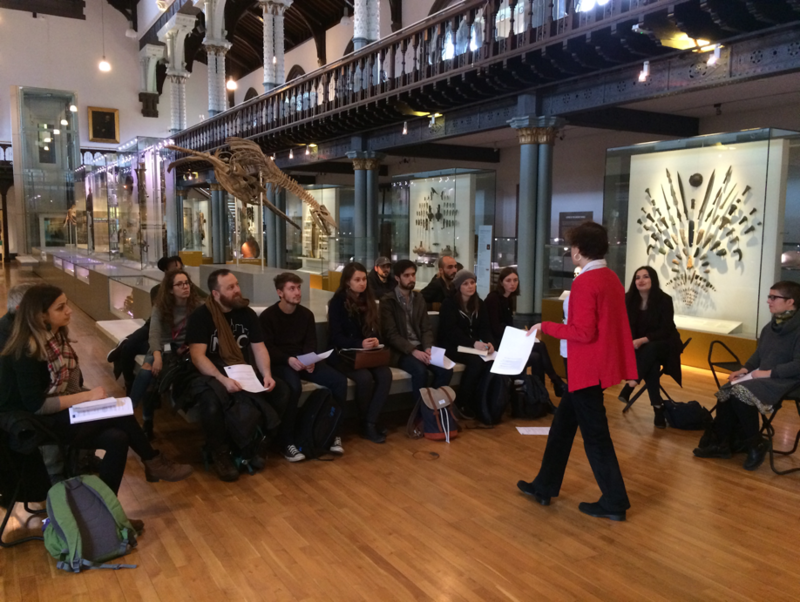 We were able to test the personas at our first user experience design workshop in February (images 1 and 3) and again during a seminar with students from the Glasgow School of Art Heritage Visualisation MSc in May 2017 (image 4). During both sessions we split our workshop participants into groups and asked each group to design an EMOTIVE experience for their designated persona or personas. Although all workshop participants were presented with individual personas, they understood that they needed to take into account how any individual persona’s needs and characteristics would affect a group dynamic and that this was key to the success of any experience they designed. The participants reported that designing group experiences for more than one persona was challenging but important. For example, the group designing an experience for Mary and Annie (the grandmother who wants to pass on her love for objects and heritage to her grandchildren and the granddaughter who is bored by museums but wants to do something nice with her granny) felt that this was an “interesting and challenging combination” because of the differences in what they individually wanted to achieve with the visit tempered by the fact they were visiting together. Similarly, the group designing for Carlos who gets talking to Susie in the museum “understood that from the conception of the experience, this had to be something that would engage two different people with very different reasons for visiting.” This group noted that “interacting not only with the materials but also with each other was a crucial factor” to the success of any experience. So, throughout this process we had to ask ourselves: How do you cope when in a group one person dominates or “leads” the experience? Is it always the person you expect who has the biggest impact on an experience? What different ways are there of coping with people who dominate the situation? By creating multiple individual personas and asking our workshop participants to design experiences for different combinations of them, we were drawn to thinking about how individual behavioural characteristics might impact on the same design task at hand, which in turn allows us to think about how to balance differing user needs. At the end of the design process we asked our participants to dramatise the experiences they had designed. Yes, dramatise! And the groups obliged by getting with gusto into the character of their personas as well as, in some cases, the EMOTIVE application itself, creating some laughs in the process… (image 5). This dramatization of ideas using the “entire body” is also called “bodystorming”, a technique often used in interaction design and creative development (Simsarian 2003). The idea was for the participants to imagine what it would be like if the product (or EMOTIVE experience, in this case) they designed existed, and act as though they were using it. Dramatising the experience and personas within the Antonine Wall display allowed the groups to really think about how the personas would physically interact together, within the actual display space and allowed the research team to think further about group experience dynamics. The dramatisation was fun and we enjoyed seeing our personas “come to life”. The overall experience of using the personas helped all groups focus on real users and for the research team integrate a participatory, user-centred approach when co-designing EMOTIVE experiences. Falk, J. (2016). Museum audiences: A visitor-centered perspective. Loisir et Société / Society and Leisure 39 (3), 357-370. Falk, J.H. and Dierking, L.D. (2012). The Museum Experience Revisited. Walnut Creek, CA: Left Coast Press. Hein. G. (1998). Learning in the Museum. London: Routledge. Katifori, A., Perry, S., Vayanou, M., Pujol, L.,Chrysanthi, A., Kourtis, V., and Ioannidis, Y. “Cultivating mobile-mediated social interaction in the museum: Towards group-based digital storytelling experiences.” MW2016: Museums and the Web 2016. Published January 15, 2016. Consulted August 25, 2017. Simsarian, K.T. (2003). Take it to the Next Stage: The Roles of Role Playing in the Design Process. In Ext. Abstracts CHI 2003, ACM Press (2003), 1012-1013. Blog post written by Maria Economou and Hilary Young from the University of Glasgow EMOTIVE team.